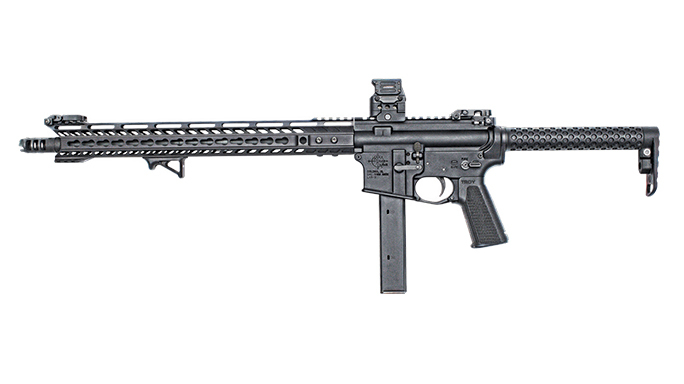 The Rock River Arms LAR-9 offers small-cartridge performance in an AR package. 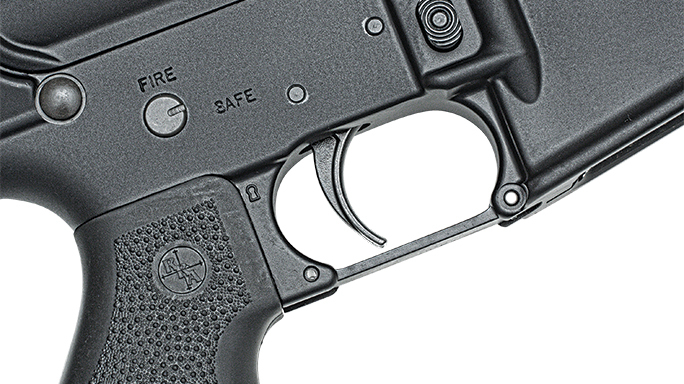 The standard mil-spec trigger was changed out for an ALG Defense QMS trigger. 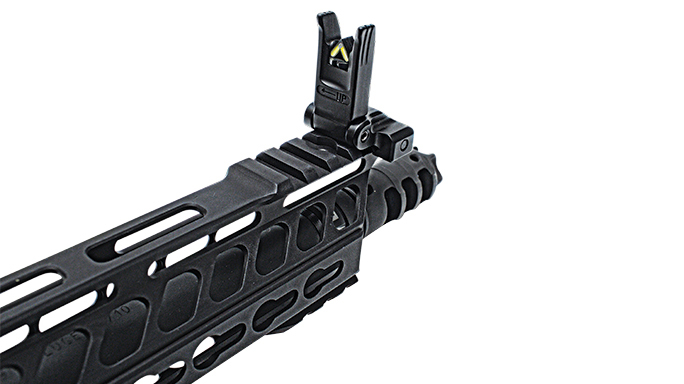 The Battle Arms Development Sabertube is the epitome of minimalist design. The Vella Industries Trident rail and Lantac Dragon DGN9MMB muzzle brake enhance the front end. 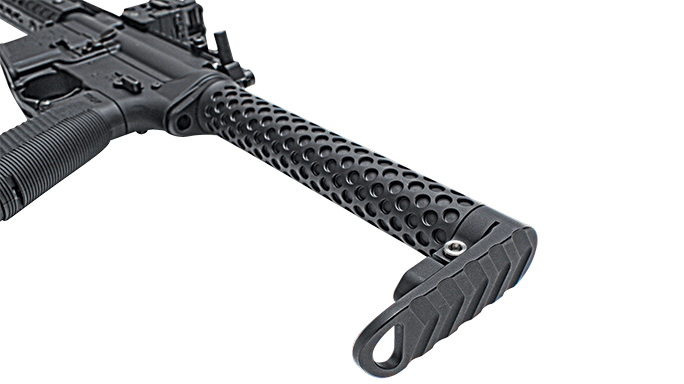 The ambidextrous Avalanche’s handles are interchangeable and offer a number of customization options, including knurled handles (shown). The LAR-9’s integral mag well is made specifically to accommodate modified Uzi and Colt SMG magazines. 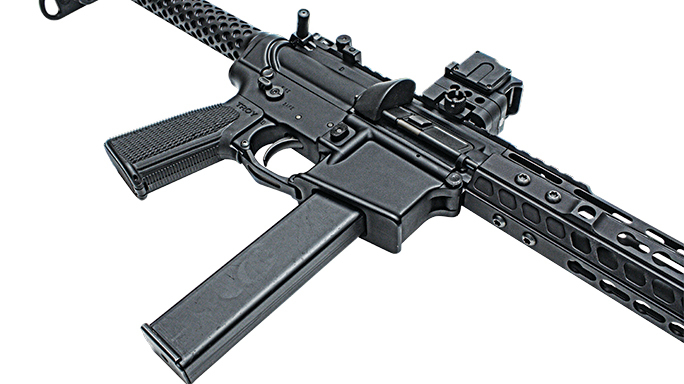 A Troy Industries pistol grip replaces the stock unit. We swapped out a few components to dress up and enhance the stock LAR-9 to something a little racier. The Rainier Arms front iron sight is fitted with a Blitzkrieg Components tritium chevron front sight post. 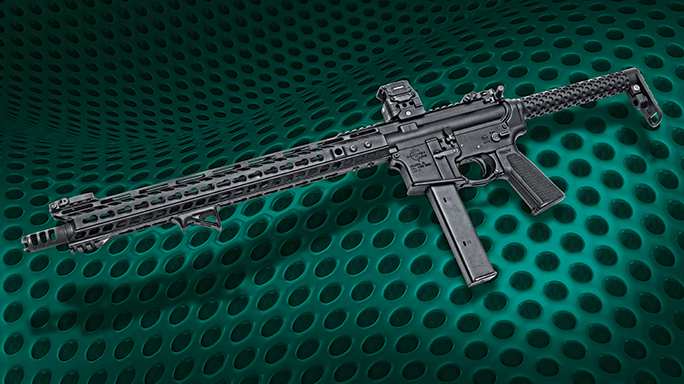 RRA’s marked 9mm A4 forged upper receiver. 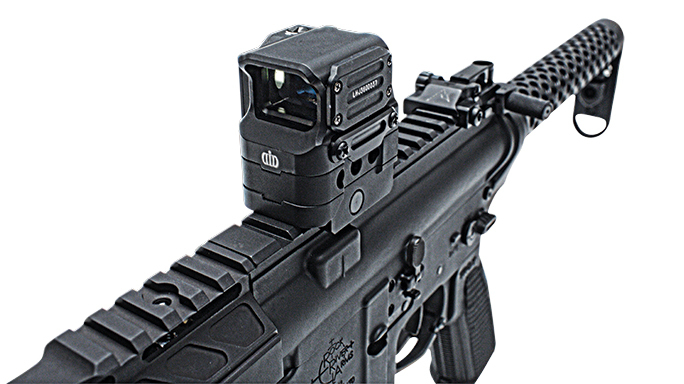 DI Optical’s FC1 weighs 4.2 ounces and boasts a parallax-free 17x23mm lens, with seven night-vision and seven daytime illumination settings. 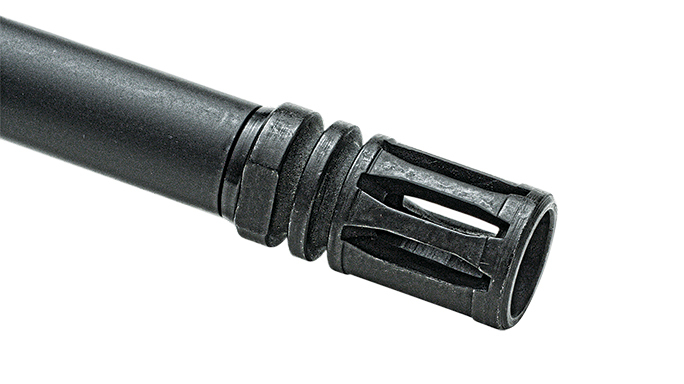 The A2 flash hider is opened up for 9mm and has a 1/2-36 thread pitch. 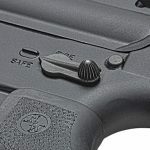 This stock safety selector design is unique to RRA. The gas block’s rail is positioned at the same height as the receiver’s. 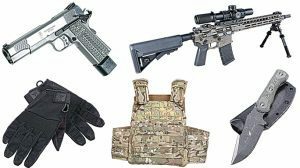 In the tactical community, most companies strive to be on the cutting edge of innovation—newer, lighter, faster, flashier, fancier. In some cases, these new companies fall flat on their faces or are the proverbial flash in the pan, burning brightly for a few moments in a blaze of clever marketing and celebrity endorsements and fading away almost as quickly due to bad business decisions or a lack of actual substance behind the hype. Other companies, however, forgo the flash and panache and stay simple and plain but reliable. 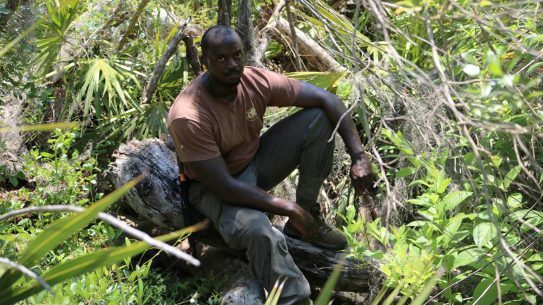 Rock River Arms (RRA) is one of those companies. 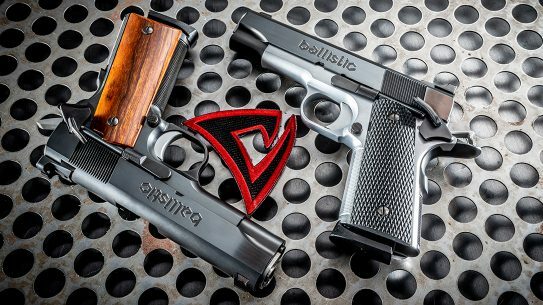 Based out of Colona, Illinois, RRA started off in the custom 1911 market. 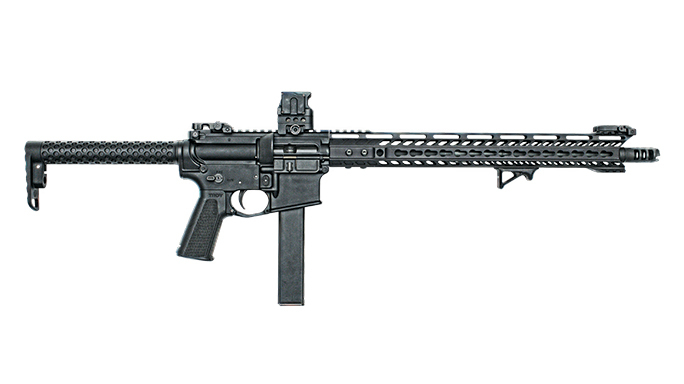 Later switching over to AR-pattern rifles, RRA won a reputation (as well as a few government contracts) for solidly built AR variants with proven aftermarket products. One of the company’s variants is the LAR-9, a dedicated 9mm carbine that has proven over time to be a solid contender. I had an opportunity to handle and shoot one of the newer configurations recently, and it was a good deal of fun. Now, since this is Ballistic magazine, the model I handled was more tricked out than others, but I’ll begin with the basic RRA LAR-9 in its stock configuration. If you’ve never handled an LAR-9 before, one of the things you’ll immediately notice over other manufacturers is that RRA offers a dedicated integral 9mm mag well. I much prefer the integral mag well; although there is more aluminum in the mag well area of the receiver due to the smaller mag well required to accommodate the modified Uzi mags, its heft and the sturdy feel gives more confidence that the LAR-9 was solidly built. Since the LAR-9 is a 9mm carbine, it is a blowback-operated system, unlike the standard direct-impingement system of its .223/5.56mm brethren. The LAR-9’s 16-inch barrel has a 1-in-10-inch twist rate for the 9mm cartridge. 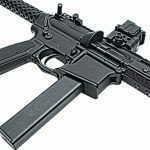 As it arrives straight from the factory, the LAR-9 comes standard with typical M4-style handguards and a basic collapsible stock. Without getting into a huge caliber debate with multitudes of ballistic experts weighing in, let’s take a look at the LAR-9 as a viable weapon platform for real-world use. 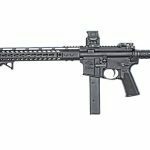 Is there anything that an AR platform chambered in 9mm can do better than a typical AR chambered in .223/5.56mm or 300 Blackout? While shot placement is king, there still is something to be said about the 9mm indoors regarding noise and shot controllability. Anyone who has cranked off 9mm and 5.56mm rounds inside a building can attest to the difference in decibel level and concussion. Now try running a suppressed 9mm indoors versus a suppressed 5.56mm, and the advantages of the 9mm are even clearer. 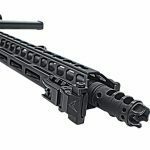 While the 5.56mm round is controllable to say the least, so is the 9mm, and it’s even more so when you factor in three additional points of contact afforded by the AR-style platform. 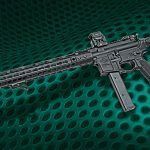 Now these considerations alone should not necessarily sway an end user, especially a prospective LE/military contract, over to the 9mm platform from the 5.56mm. 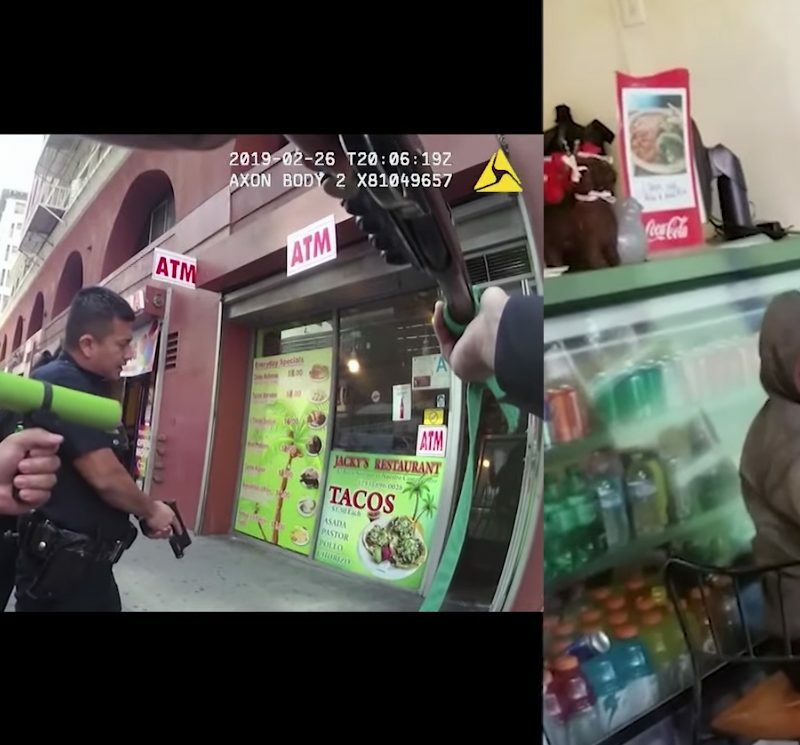 However, many federal agencies and local departments are consistently moving away from other calibers such as the .357 SIG and .40 S&W to the 9mm. Lastly, and possibly a more compelling argument for me, it comes down to training. A single round of factory 9mm ammo currently costs between $0.19 to $0.39, while standard .223/5.56mm rounds run about $0.32 to $0.47 each. Training on an LAR-9 allows users to practice using a familiar AR-style platform with the same manual of arms from a more budget-conscious ammunition supply—not to mention that it can be shot indoors without restriction, and in closer proximity to steel targets than 5.56mm-safe distances will allow. 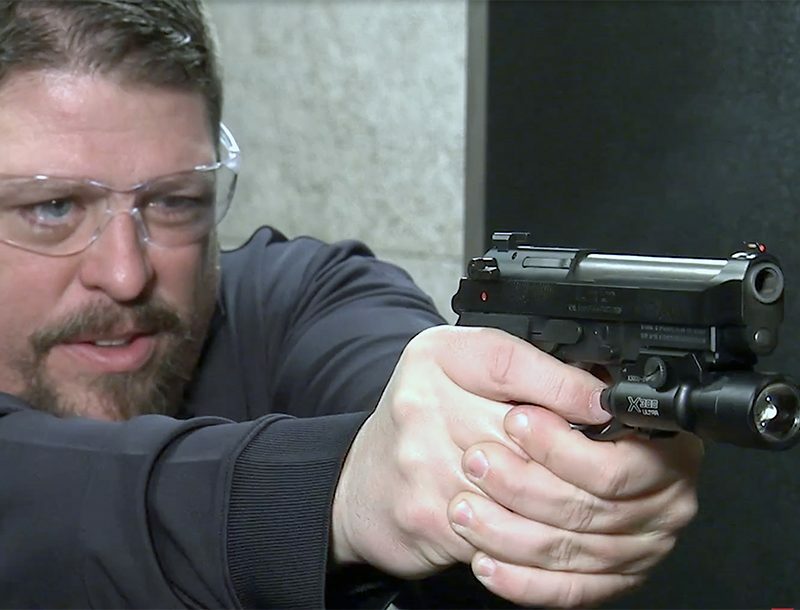 When assigned this article, I figured it’d be best to freshen up my 9mm carbine information, so I talked to Steve Mayer, the LE/government sales manager for RRA. 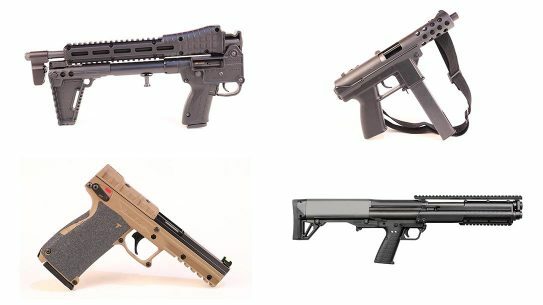 I had some questions regarding the design of the LAR-9 bolt and blowback system, as a few other 9mm carbines out there are finicky to say the least and haven’t quite cracked the timing code for a reliable 9mm blowback system for real-world use. I was not concerned at all about the LAR-9’s manual of arms, as everything else is the same as a standard AR-15 configuration. 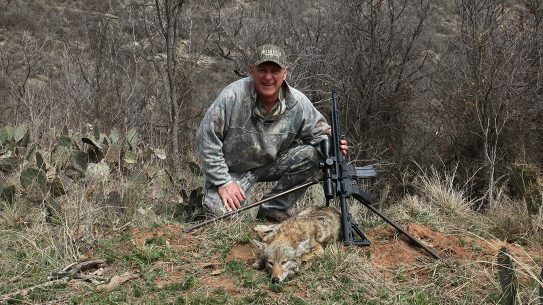 My real concern was geared more toward bolt and trigger systems as potential snags for a smooth-running and reliable carbine. RRA’s Steve Mayer addressed my questions: “We modified the bottom of the carrier—well, let me call it a bolt, actually, since it’s not really a bolt and carrier, it’s a straight blowback design rather than a reciprocating bolt moving within a carrier, so it’s a fixed assembly. All we really did was to change a few dimensional tolerances, and we ramped it directly from the factory. 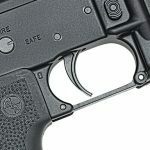 Due to the variances in trigger assemblies from different manufacturers, I asked Mayer if there were a list of manufacturers that were known not to work with the new bolt. He told me that they hadn’t put out a known list, but that “[We] have a diagram on our website with the 9mm components including the hammers that we sell and make available that do and do not work with it. We can’t get into everybody’s aftermarket triggers, because there are hundreds of them out there, and as soon as we made a list, there’d be more that would make the list, so we just use the ones that we have available. 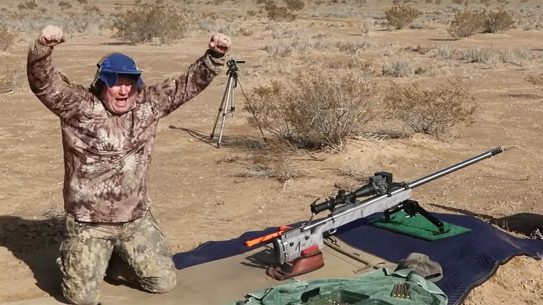 “Previously it would only work with a 9mm hammer and a non-notched full-auto hammer, but now it works with pretty much any non-notched hammer and doesn’t work with the old 9mm hammer. Let’s take a look at what we did to the plain-Jane LAR-9 to give it the Ballistic treatment. 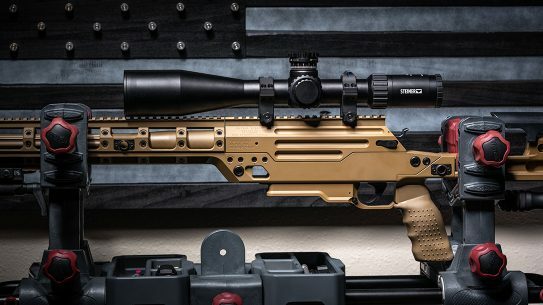 A carbine fit for these pages not only has to function well, it has to look good doing it. We swapped out a few components to dress up and enhance the stock LAR-9 to something a little racier. 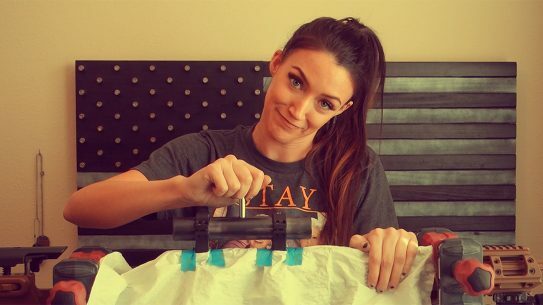 Here’s how we did it. 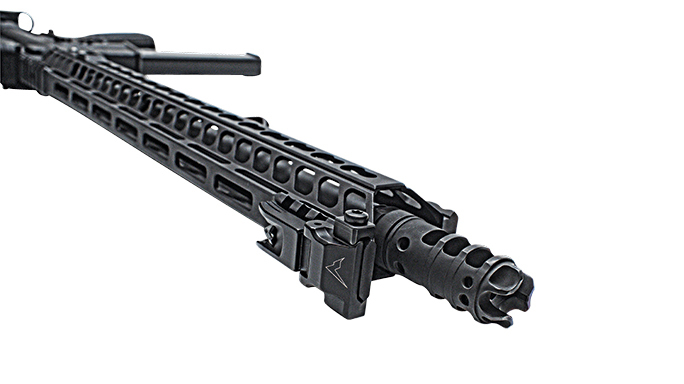 We read up on the changes to the LAR-9’s bolt assembly for 2015 on the RRA website. Do the same if you are looking to upgrade or modify your LAR-9. In my experience with the LAR-9, even if a new trigger pack or assembly function checks out fine in the shop, it might not always go bang at the range—or worse, in real life. Be sure to not only function-test but live-fire your builds prior to trusting your life to them, as the wrong hammer or trigger assembly can make for a really bad day. 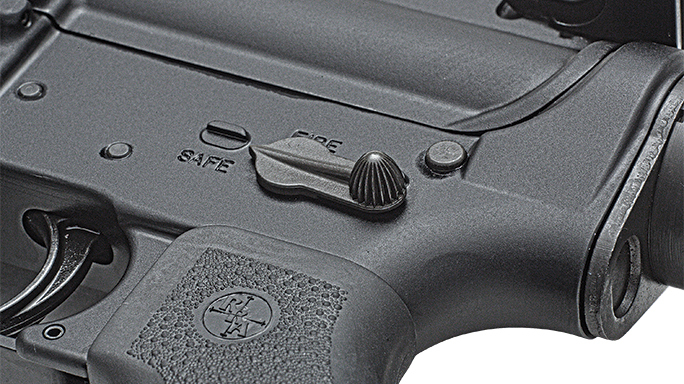 To avoid this issue, and keeping Mayer’s counsel in mind, we swapped the standard mil-spec trigger out with an ALG Defense QMS trigger and used a Blitzkrieg Components 9mm buffer. Blitzkrieg Components is best known for its revolutionary chevron front sight posts, which are a personal favorite of mine. 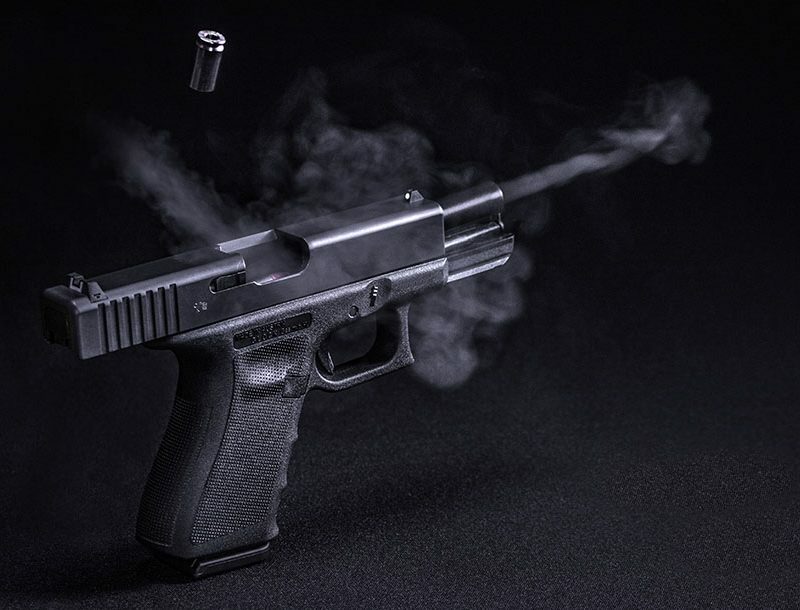 The company entered the 9mm buffer game by partnering with CTS Engineering, and created a buffer system utilizing CTS’s patent-pending AKTIVE buffer technology, a two-stage buffering action utilizing a solid stainless-steel buffer body and a polymer piston head. Both function and live-fire tests proved the upgrades were in fact beneficial, with no misfires, misfeeds or failures to note. We didn’t have time to wait on a tax stamp to SBR the 9mm carbine as I ideally would have liked, but in keeping with the lightweight theme, we went with the Battle Arms Development Sabertube QD End Plate Combo. 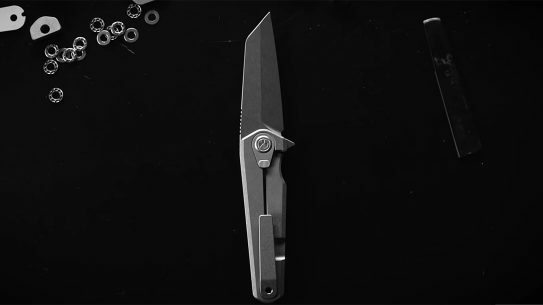 This svelte and beautiful offering is the epitome of lightweight and minimalist design, with the entire combo weighing in at about 6.75 ounces. 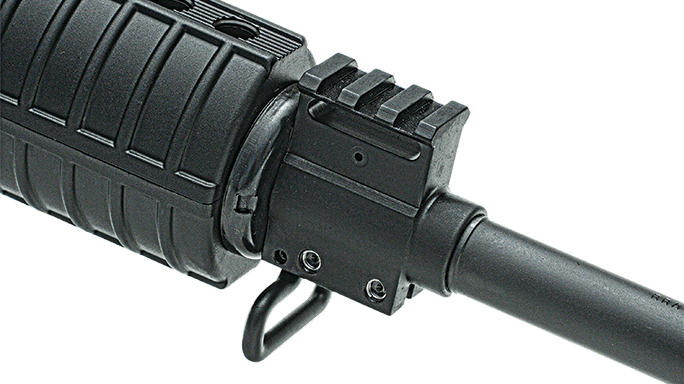 The Sabertube, CNC’d from a billet of 6061-T6 aluminum, is mil-spec carbine buffer and buffer tube compatible. Other than its unique dimpled look, enhanced by hard-coat anodizing, the design of the Sabertube eliminates the need for a castle nut. The end nut and buttstock are also CNC’d from billet aluminum, but from the 7075-T6 pedigree. The end plate comes with a built-in 30-degree-rotation-limited QD attachment. The barrel was sheathed in the new Trident Rail by Vella Industries and tipped with a trusty Lantac Dragon DGN9MMB. 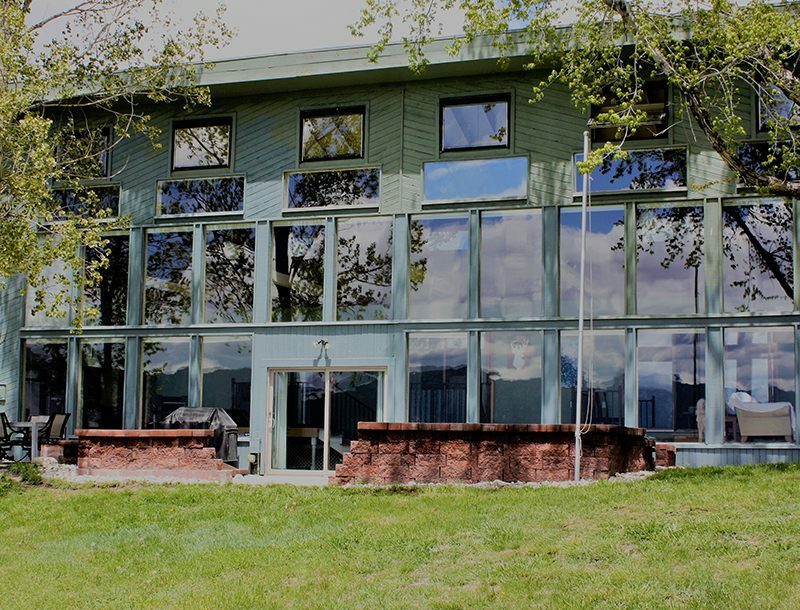 Vella Industries is an intriguing company, and its 6061 aluminum rail is aptly named the Trident due to its radical front end look. 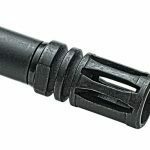 The Trident we used is 16.5 inches long, with an outer diameter of 1.52 inches and an inner diameter of 1.35 inches, so don’t try to use this rail if you plan on tucking a suppressor. 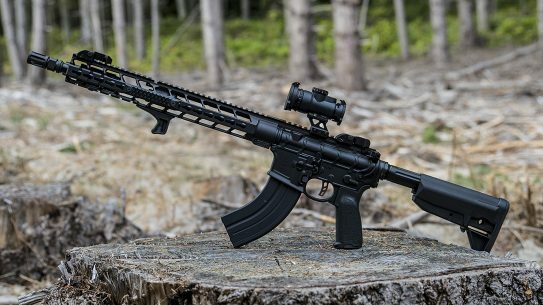 Weighing in at a lightweight 11.5 ounces, the Trident boasts KeyMod points at 3, 6, and 9 o’clock, and M-LOK points at the 12 o’clock position. 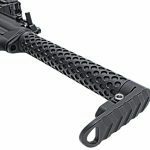 Slung under the rail is an Odin Works KeyMod B1 handstop. 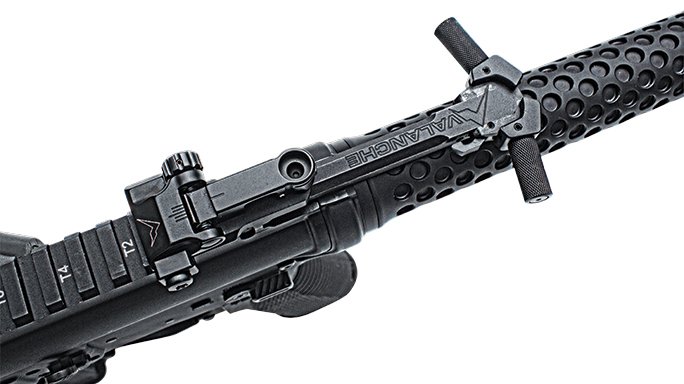 It is designed to give the shooter’s support hand better control with its ergonomic-grip angle. The sights we installed, both primary and backups, are newcomers to the market. The primary optic used on this build was the FC1 from DI Optical. The Korean optics company produces military-grade equipment and counts the South Korean military as a customer, and its commercial product line includes the FC1. 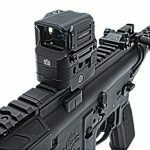 The FC1 weighs in at 4.2 ounces and boasts a 17x23mm parallax-free lens, with seven night-vision and seven daytime-illumination settings. Although it’s extremely affordable, the FC1 is in fact rated to meet MIL-STD-810G durability testing standards. Not bad for a “budget” red dot. I look forward to using and abusing this sight as time goes on. 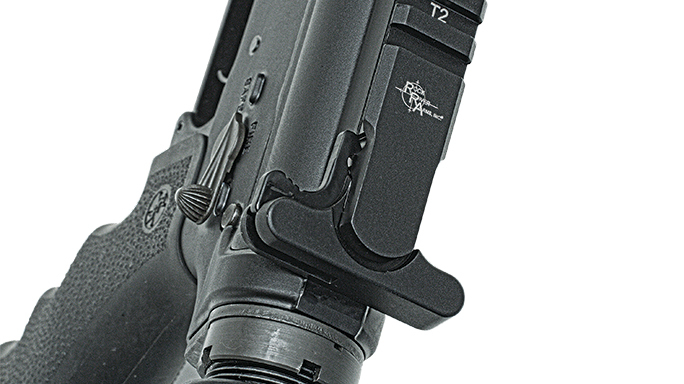 The backup iron sights (BUIS) on this build are a new offering from Rainier Arms. The company’s new BUIS are made in Germany and boast a slick design. 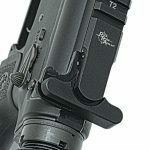 The best part about the Rainier Arms BUIS is that the rear sight can be completely folded down regardless of which peep setting is selected. 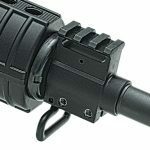 Both the front and rear sights snap positively into place thanks to precise detents, and the sights do not lock open or closed. I was very impressed by the execution of these sights. 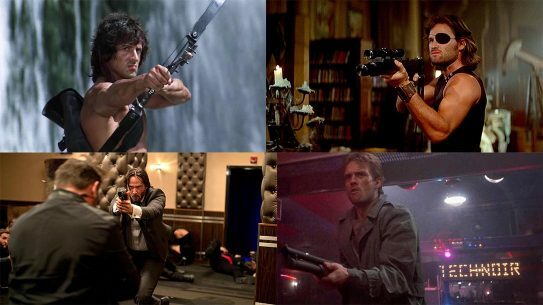 I personally also appreciate that they do not lock into place—I’m the type of guy who bangs sights against obstacles, so the fact that they won’t break if presented with a good amount of force made me a believer. 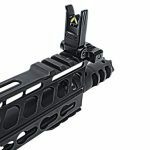 The sights were further enhanced by a Blitzkrieg Components tritium chevron front sight post—all the benefits of the chevron sight plus the addition of a tritium vial at the apex of the chevron makes it tough to beat. So, pretty upgrades aside, how did the LAR-9 shoot? It works, and it works well. In fact, it was almost boringly reliable. I used one of the modified Uzi mags that came with it, so I can’t speak to other products that are out there, but I had no malfunctions of any kind for the short time I had on the trigger. I specifically looked for issues surrounding the bolt failing to lock back and failures to feed, none of which I experienced using factory Speer 124-grain Gold Dot +P and Blazer Brass 115-grain ammo. 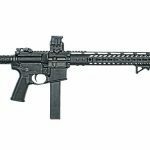 The LAR-9 is a soft shooter, and, of course, with the added inherent stability of shooting through an AR platform, the carbine is lightweight, easily manipulated and a breeze to shoot. Being a patrol rifle officer, I’m married to the .223/5.56mm platform for my professional life, but I can definitely see the benefit of utilizing the LAR-9 platform for training or shooting indoors. All in all, the LAR-9 seems like a fun, reliable and cost-effective alternative to training on a full .223/5.56mm platform, and depending on your caliber requirements or ballistic needs, an AR chambered in 9mm may just fit the bill. 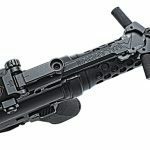 For more information on the LAR-9, please visit RockRiverArms.com. WEIGHT UNLOADED: 7 lbs., 1.6 oz. 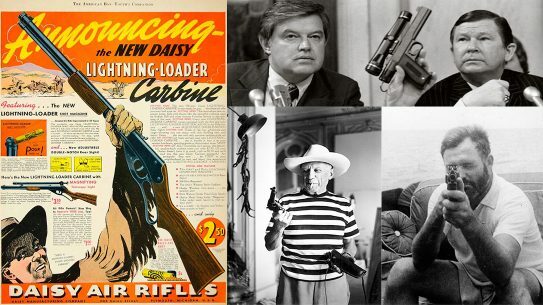 What’s On the Cover of Ballistic Magazine Spring 2016?